Unscented. 2 to 3 Feet. June flowering. Very fluffy, double flowered, the six inch blooms on this sunny-yellow cultivar have a few purple specks. Probably the fullest, multi-petaled pollen-free lily ever produced. We have done trials on a number of double yellow Asiatics, and 'Little Yellow Kiss' has never had anything come close to it for color or fullness. 2 to 3 Feet. June Blooming. Unscented. 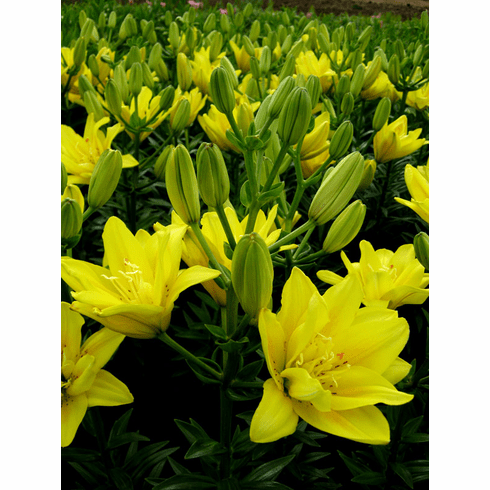 Bulb Size - Our standard for bulbs of this Asiatic Hybrid Lily Bulb cultivar ranges from Premium-size (14/16 cm) to Exhibition-size (over 20 cm).